The Metalcraft Master Punch and Shear Tool is a robust, dual purpose steel guillotine and hole punching tool for the easy cutting and punching of mild steel strip and bar up to a maximum of 6mm thickness. The metal punch tool easily punches holes in steel by using a punch block and pin which is specially machined and hardened for the task. The metal is simply placed in the slotted punch block and holes are easily punched by pulling down on the handle. To achieve accurate positioning along the centre of different widths of bar, the adjustable platform is used to ensure consistent results. The hole punching facility on this Punch/Shear machine, also compliments the use of our Master Riveting/Bending/Rolling Tool to easily and quickly rivet lengths of punched steel strip together. When used as a metal bar cutter, the mild steel strip, square bar or round bar/wire, is fed into the aperture between the small fixed blade and the larger lever operated blade, after which the lever is simply and firmly pulled forwards to achieve a clean and neat cut. This handy Master Punch/Shear Tool is accompanied with a measuring bar to facilitate the precise measurement of cut lengths of steel every time, as well as ensuring the distance between punched holes and the centre of a punched hole to the end of the bar is consistently accurate. Because this metal punching tool and steel guillotine is portable and requires no electrical power, it is well suited to ‘onsite’ work and can be used in any DIY, training or production environment. N.B. 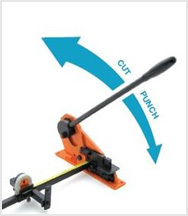 On Master Machine handle, can be reversed to cut and punch in opposite directions. 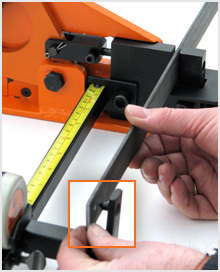 This feature enables you to set repeatable cutting lengths or hole punch positions (from end of bars or from other holes).